I had first come across Burger Singh, while exploring Connaught Place a year ago and had loved the taste of their United States of Punjab Veg Burger. Fast forward a year, and now there are branches of Burger Singh near my home. 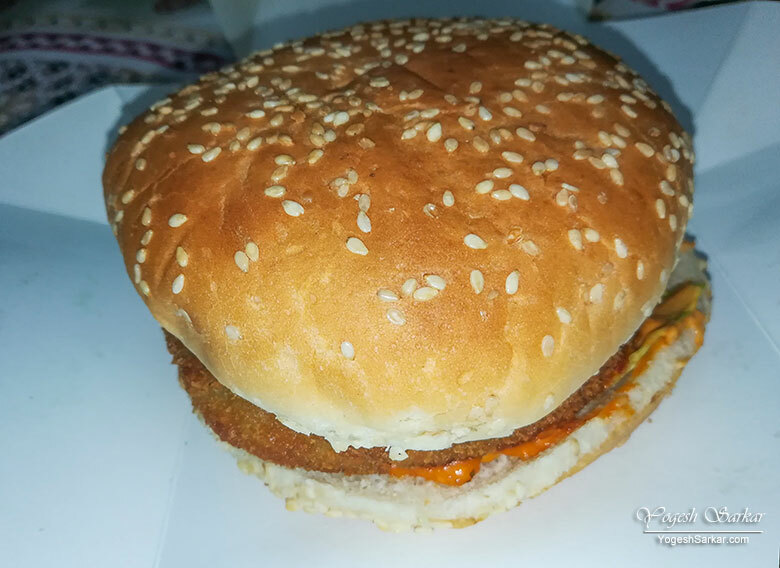 Last night, I decided to use home delivery of Burger Singh, since my sister was in no mood to cook and we wanted to eat something different from the usual burgers from Burger King. Even though Burger Singh’s burger is more expensive than burgers from Burger King, McDonalds etc. they had a 1+1 offer on their website and they do not charge extra for packing or delivery. So in the end, our order of Veg Keema Pao Burger (Rs. 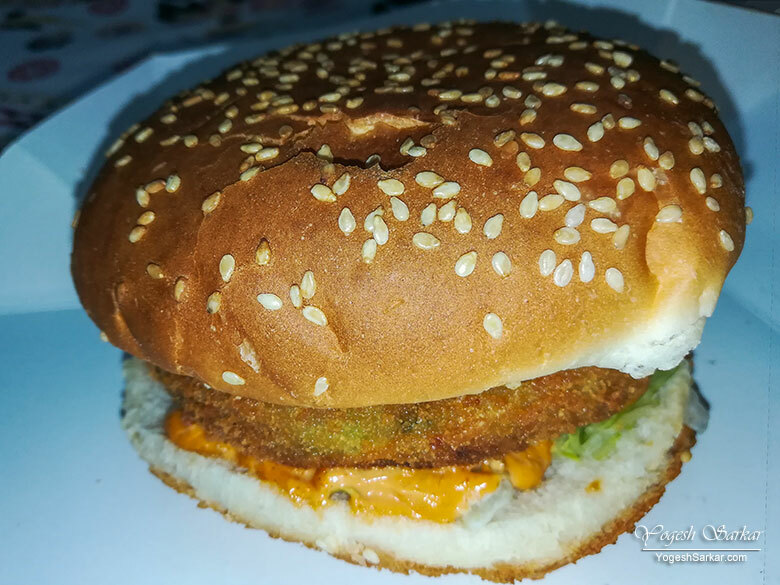 32), Veg United States of Punjab Burger (Rs. 249) and Udta Punjab Burger (Rs. 249) came out to be Rs. 295, inclusive of GST. 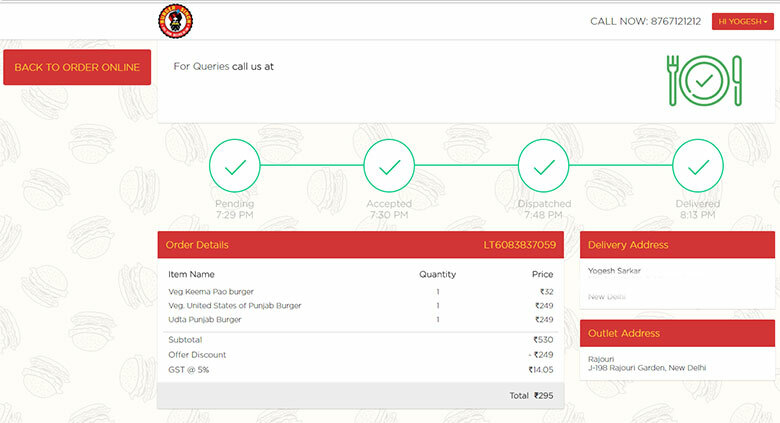 We placed the order on their website at 7:29 pm and they managed to deliver our burgers around 8:00 pm, though their timestamp below says 8:13 pm. While the Veg Keema Pao Burger was plainly packed in a paper wrap, it was really succulent and delicious with a patty made of lentils and gouda cheese, which literally melts in the mouth and was spicy and yet, not too spicy. It was similar in size as a McVeggie and had a really soft bun. 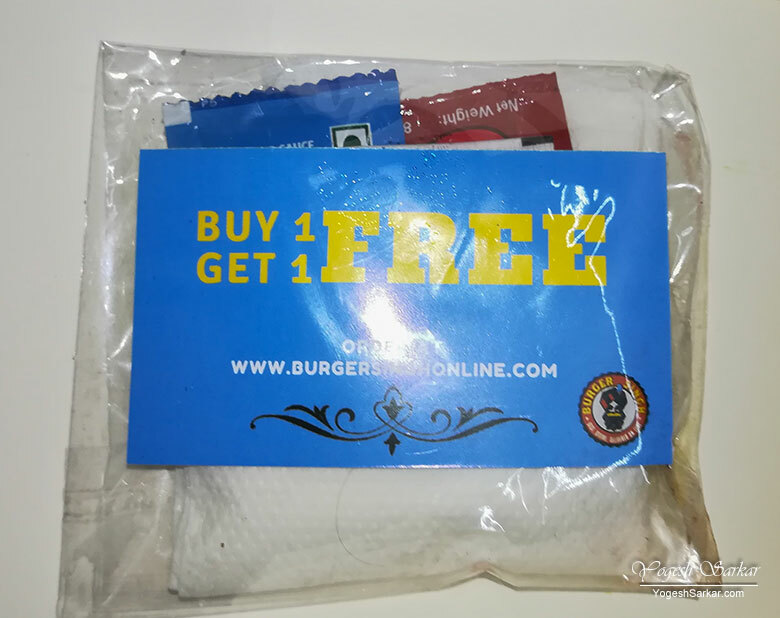 Of course, the real treat were the bigger burgers, which came packed in their individual cardboard boxes, which could be unfolded easily into a plate. 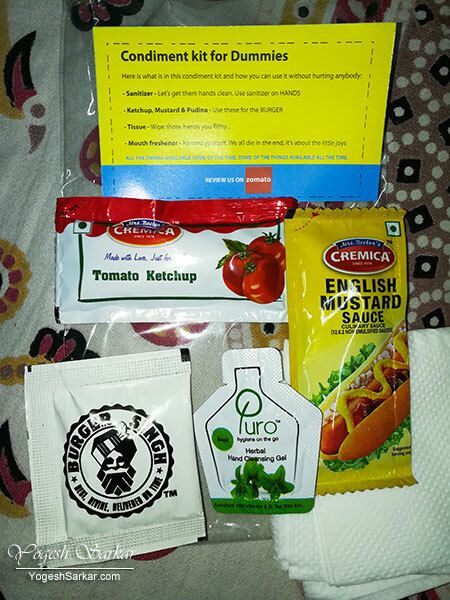 On top of that, each of them contained a packet of condiment, which had tomato sauce, mustard sauce, mouth freshener, hand sanitizer and couple of tissue papers! This I felt was a really nice touch, especially since mustard sauce and mouth freshener were delicious and the inclusion of hand sanitizer a real boon for anyone eating outdoors. The United States of Punjab Burger was delicious with a soft bun and a crunchy yet succulent patty made of cheese and mixed vegetables. The Udta Punjab Burger was a little more spicy with the inclusion of green sauce and lettuce, but that made it all the more delicious. All the burgers had thoroughly Indian flavours and yet were so soft, that they tasted better than the burgers served by pretty much all the International fast food joints in India. Add to that, both Udta Punjab and USP burgers were fairly large in size and almost enough to satisfy the hunger of a grown man, yet, leave him wanting more, due to the taste! Overall, my sister and I loved the burgers from Burger Singh and compared to the burgers we normally eat, these seemed way tastier. The fact that they were delivered in such a nice and prompt manner and were warmer than burgers we normally get home delivered by Burger King and KFC, made them an even better bet for home delivery! This is one burger joint, I am likely going to order from, again and again!